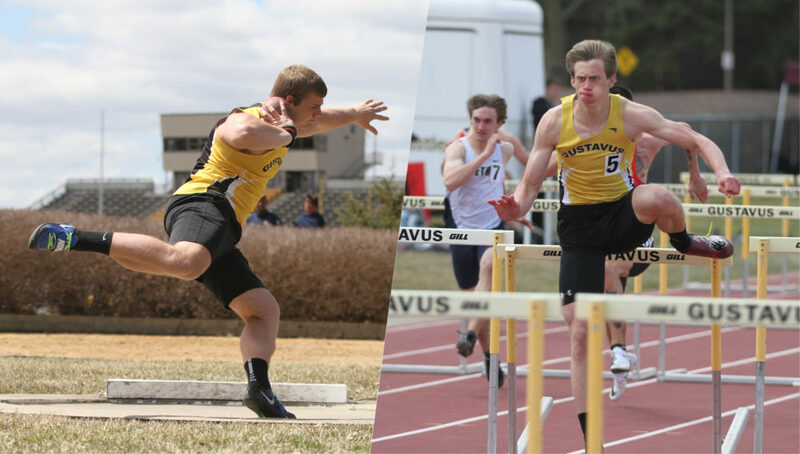 BLOOMINGTON, Minn. – The Minnesota Intercollegiate Athletic Conference announced its men’s track & field postseason awards Thursday and two Gustavus student-athletes received recognition. Michael Hensch (Jr., North Branch, Minn.) was named Outstanding Field Athlete after placing in the top-three in four separate events, while Taylor Rooney (Fy., Andover, Minn.) earned All-Conference with first- and second-place finishes. To be awarded All-Conference, individuals must place in the top-three in their respective events at the MIAC Championships. Hensch earns MIAC Outstanding Field Athlete for the second consecutive season. The North Branch native won the javelin throw for the second-straight year with a toss of 192-1. He placed second in the shot put with an outdoor career-best toss of 52-5.25. He also took second in the discus with a personal best throw of 148-2 and third in the hammer at 181-2. In his first year of collegiate competition, Rooney won the 110-meter hurdles, clocking in a time of 14.69. He also took second in the high jump with a leap of 6-5.